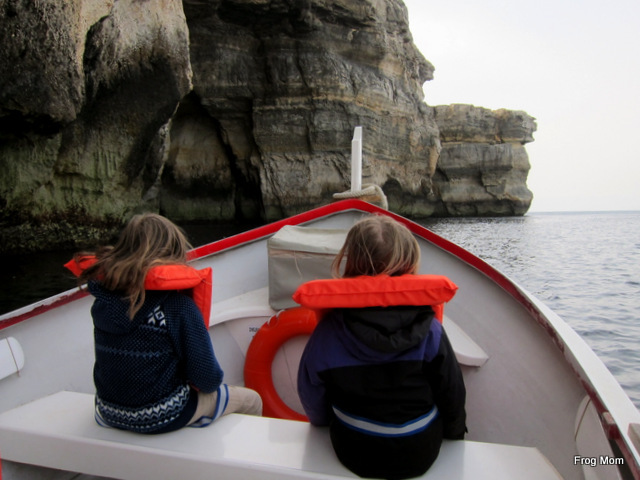 Visiting Malta with children is an ideal family vacation and my girls and I enjoyed our spring break in Malta, a sunny escape that combined ancient history, spectacular nature and – big seller for my girls – gelato (ice cream) and pasta every single day. 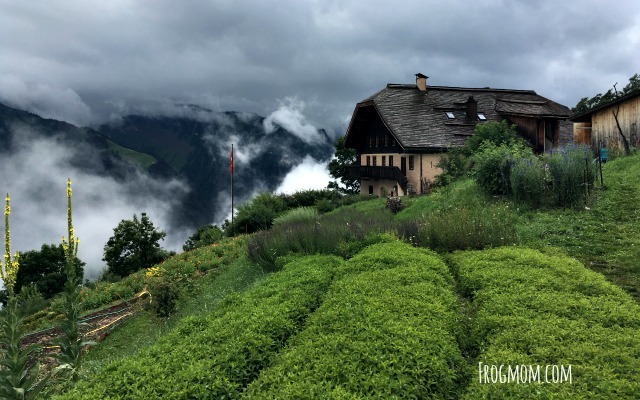 Our 4-day holiday was a great teaser to come back for more and despite the short stay, we covered a lot of ground making sure that every day included a dose of outdoors, a gelateria, a pasta meal and a cultural stop. 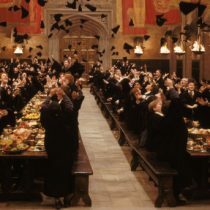 Provided we had all that, we all went to bed very happy each night and looked forward to the next day. Here is our 4-day itinerary. 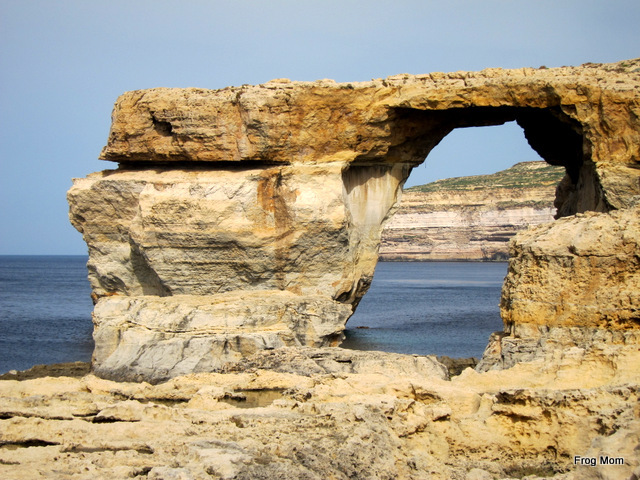 The glorious island of Gozo was first on our list. North west of Malta and easily accessible via ferry, this sister island of Malta won our hearts with its rural roads, sweeping coastline and ancient history. 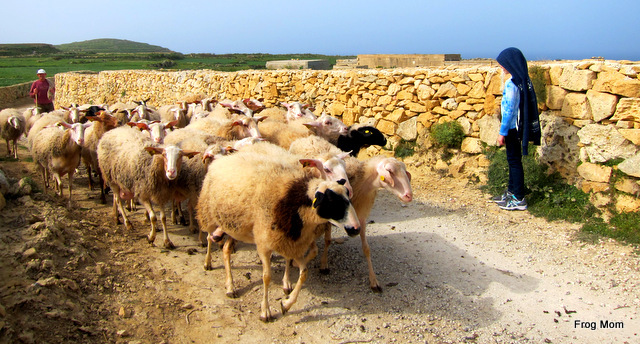 Gozo’s unspoilt scenery made us feel like we were entering a period Mediterranean fresco. 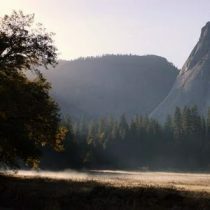 Think vast blooming fields of greens, remote chapels and craggy sea caves. All that was missing was a gladiator or a medieval knight and we got an epic quest in the making. Our discovery of the Maltese islands began with a Greek twist and by that, I mean some serious Greekology. 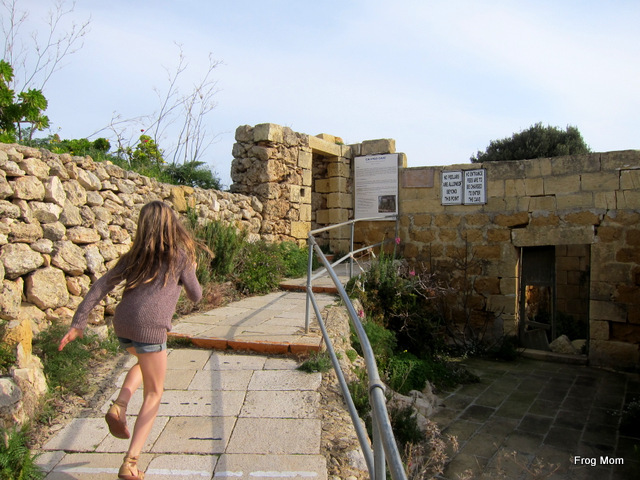 When my mythology-obsessed 9-year-old heard that Gozo was where the beautiful nymph Calypso held Ulysses captive of love in a cave during seven years in Homer’s Odyssey, she jumped. “The Percy Jackson books talk about a diamond-studded cave in Gozo!” Indeed, Gozo is thought to be the mythical phantom island of Ogygia where Calypso was imprisoned, unable to ever leave the island while others could. No wonder Percy Jackson would wash up on Gozo too at some point. While I couldn’t promise diamonds or Half-Blood Camp, I could take my girls to the actual Calypso Cave overlooking the dramatic Maltese coast. A short drive from Xaghra led us to a hilltop above Ramlay Bay and a small parking lot with a curio shop and an ice cream truck. 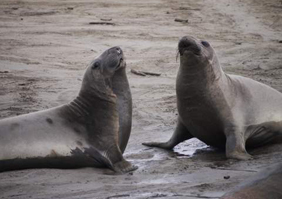 We followed a short boardwalk to a viewing platform and realized something was missing. While the view on Ramla Bay was beautiful, the cave was nowhere to be found. When I asked, the old lady at the curio shop explained. 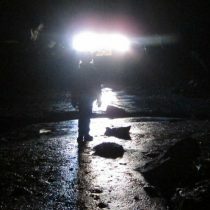 The roof of the cave collapsed and was now off-limits, its entrance barred and the cave supported by steel structures. Bummer. Despite that, the very fact we were standing on Greek mythology ground was enough to fuel a day of storytelling between my girls as my 9-year old recounted the Odyssey to her little sister. On our way back through Xaghra we stopped at Ninu’s Cave on a tip from the curio lady. “The children want to see stalagmites and stalactites? Go to Ninu’s Cave,” she said. “It’s next to the church in a private house, just ask around.” It was indeed in a private house, the most unusual cave entrance we ever saw. A middle-aged man standing on the street led us inside, turned on the light and let us descend a narrow spiral staircase. 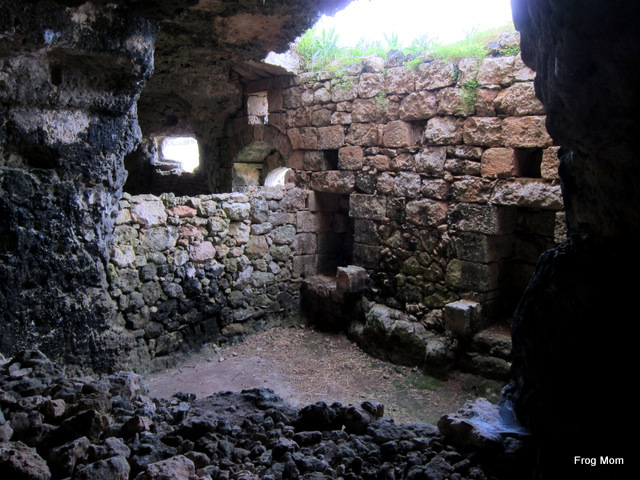 The cave was discovered in 1888 by the owners’ grandfather while he was digging a well and so, the staircase occupies the space of the old well. 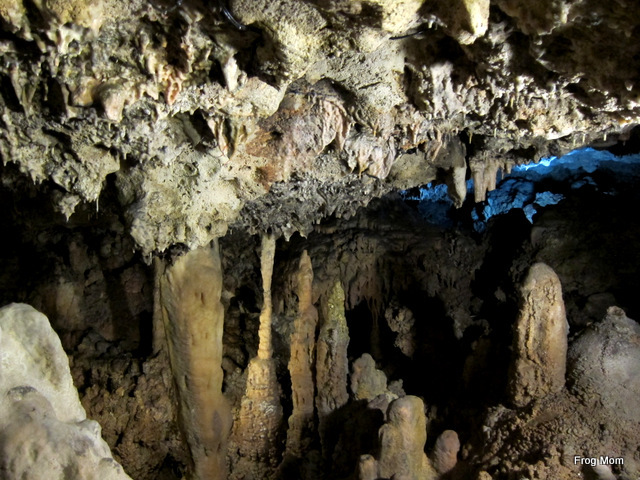 Down there, a small stone chamber set the scene for animal-like calcite formations, stalagmites and stalactites. The chicken wire – a necessary protection of the cave from visitors – added a fun DIY touch. Next stop: the famous Azure Window and Blue Grotto at Dwerja Bay. A spectacular limestone arch over a deep-blue sea, the Azure Window has now collapsed into the sea but the area is still a beautiful cliff-top landscape with spectacular sea views. To better see the coastline, we hired a small fisherman’s boat at the harbor and slowly cruised away. My girls were elated. 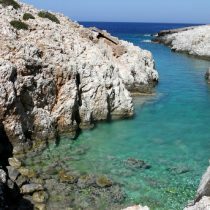 With their life jackets on, they marvelled at the crystal clear waters in the sea caves, pointed at bright corals right under the water line of the caves and silently stared at the impossibly high and narrow tunnels we navigated through. From our watery vessel following the base of the cliffs, we were able to take in their whopping size as no land walk would have allowed us to. Wow. We seemed so small and vulnerable all of a sudden. Back on land, we fulfilled the gelato promise of the day on the parking lot, courtesy of a gelato truck! To cap off a coast and cave day, we headed to Xlendi. Wedged between majestic cliffs, this picturesque fishing village was to be our lunch spot and the pasta meal of the day. My 7-year old discovered red pesto and its delicious sun-dried tomato flavor. To walk off the pasta, we explored the pier on the right side of the bay and were surprised to find a staircase carved in the stone and going up the cliff. Even better, it led us down to water level at Ta Karolina’s Cave where my girls had the time of their life playing with the incoming tide and scrambling on the rocks. Like most children, my girls love farm animals and a good story. 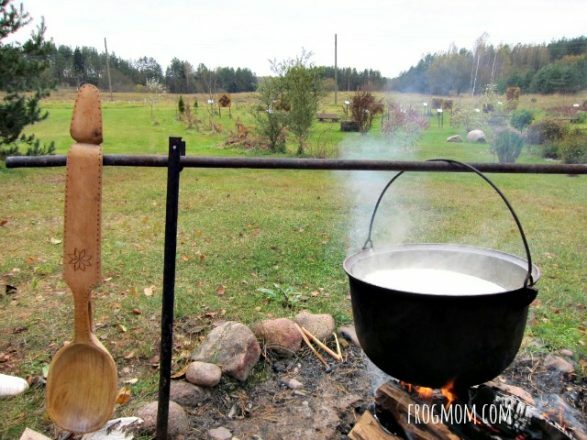 Thus our second day centered on local farms and legends, a great way to dive into Gozoan culture from the land. 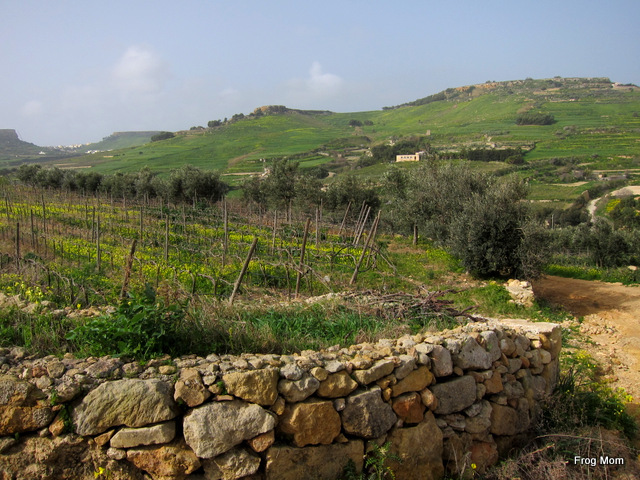 Asking around about agri-tourism on Malta, I found Ta’Mena Estate right outside of Xaghra and Malsalforn. Specialized in olives, wine, tomatoes and citrus fruit, Ta’Mena was the perfect place to learn about Gozitan traditional farming. After breakfast, my girls and I dropped in at the road-side store and got a very warm reception by the owner, Margaret Spiteri. When she saw the girls, she gestured for us to come in and pointed us up the hill right away. “Take your time with the children. Walk up the dirt road and through the orchards. Look for the mountain goats in the pen. The geese might be roming around in the hills. Sorry but the donkey is at my sister’s.” Following her directions, we wandered off up the dirt road that went up the hill in a snaking pattern above terraces of fruit trees and vineyards. My 9-year old scanned the rock walls for lizards to catch. My 7-year old sniffed the air for scents of honey flowers. 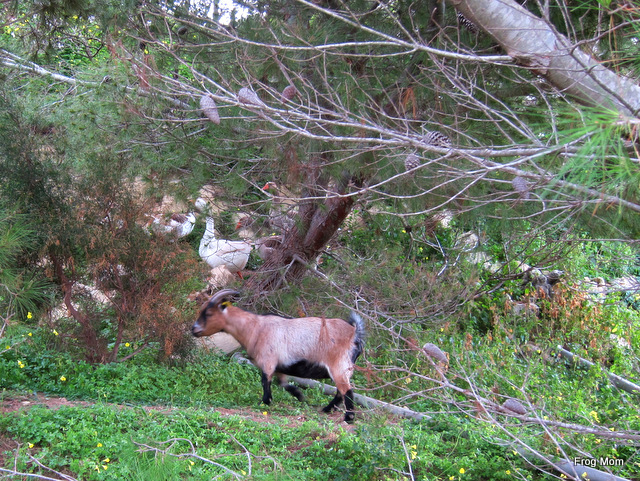 Just a little ways up, we saw them – three mountain goats! They were so small they looked like miniature goats. A man came in to feed them while my girls adapted the Three Billy Goats Gruff story to the goats in the pen. A few feet away amongst pine trees, three of four big geese were hiding from us. After we’d had our share of farm animals, we came down the hill and noticed the radiantly yellow fields on surrounding hills. Spring had officially started in Malta! Down at the store, Margaret gave us passionate details about their olive orchards, how their farm had more trees than the president of Malta and how Julius Caesar himself had his olive oil shipped from Malta because it was so good because of specific climate conditions. With a Julius Caesar seal of approval, we could do nothing less than bring back a couple bottles of this cold-pressed olive oil. We also bought fresh sheep cheese, cherry tomatoes and fruit for a picnic lunch. Yum! Our next stop was the city of Gharb for a lovely country walk that started downtown right in front of the main church. 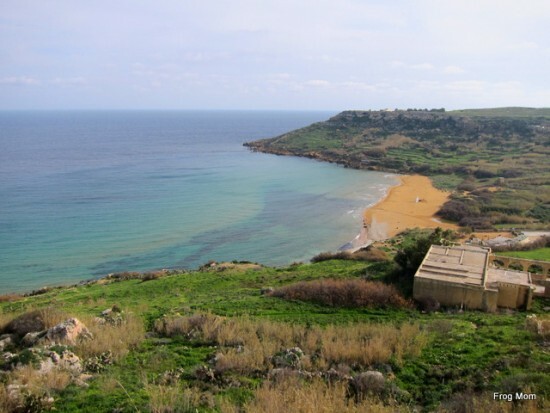 For this walk, we loosely followed a touristic itinerary called “Wield Il-Mielah – Gharb Country Walk” whose brochure and map we got at the tourist office in Victoria. You can find more details about the walk here but as a pointer, it took my girls and I 4 hours to walk from the main church to the coast and back, stopping often and long to eat a picnic lunch, play or just enjoy the view. We started downtown and followed a street that turned from residential to half rural and then a country road and then nothing but the wild coast and us. It was like the city gradually disappeared and the country slowly opened to us – a beautiful and slow way to travel through rural countryside. En route we read all the stories and legends posted on the touristic information posts we found. There was the story of the old woman who ran out of oil to light the Holy Picture in at Santu Pietru the church and discovered a trickle of oil flowing from beneath the chapel’s parvis. There were a few infomercial posts on local wineries or olive oil farms. And then our favorite, the fabulous story of how the image of San Mitri jumped out of a painting in a chapel on his horse to rescue the only son of a poor woman who had been kidnapped by pirates. Now that was an epic story – and the lone San Mitri chapel overlooking the city felt right out of a storybook. Once way out in the country, we walked alongside open fields so colorful with flowers that my girls couldn’t resist stopping to make a few flower bouquets. We even shared the road with a few dozen sheep being herded to new grazing fields. A beautiful highlight was the coastal cliff walk with its craggy weathered terraces, views on the raging sea and the spectacular It-Tieqa’ Wied il-Mielah, an arch window over the sea. In the end, this country walk introduced us a beautiful area of Maltese nature that truly immersed us in the spirit of the island. After Gozo, it was about time we discovered the knights whose name is famously associated with Malta and its history – the Knights of St John or the Order of the Hospitallers whose members wore a red surcoat with a white cross emblazoned on it. You’ve probably seen their look-alikes in movies on the Crusades as they were fighting monks who cared for those injured during the Crusades. 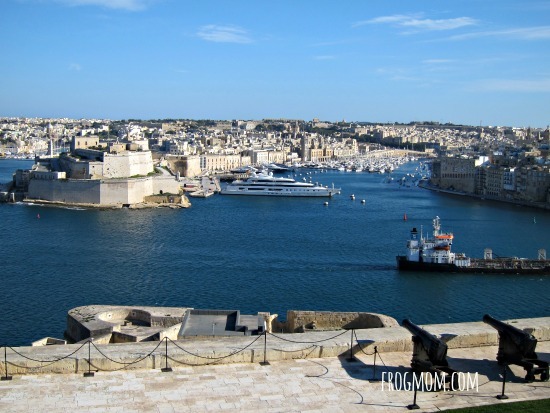 We headed to Valletta, a late Renaissance fortified city now protected as a UNESCO World Heritage Site – and Malta’s capital city. I knew my girls would not be able to log in long hours of museum windows so I did the tacky tourist thing. We started with a grand scale documentary movie called The Malta Experience to give them some historical perspective on the island. Over 50 minutes of narrative, historical account and fierce battles showed us how the archipelago had thrived and endured through waves and waves of assailants coming by sea and then by air. It was brief and shallow but my girls nonetheless retained some facts and names which was my main goal. On that base, we could now visit real buildings. After the movie, a guide took us on a tour of the Sacra Infermeria (Holy Infermary), the hospital ward built for the Order of St John in Malta. 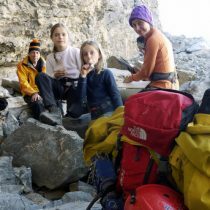 When my girls stepped in, my 7-year old huffed and puffed that it would be boring because they were the only children of the group. And yet, they were amazed by the Great Ward that measures 130 meters long (almost a tenth of a mile) and whose 131 four-poster beds with private latrines – built inside the walls – were used by the monks to cure knights, sailors and soldiers. How could they not? The grand scale of the building was beyond anything they could imagine. It’s too bad the building has now been converted into a conference center with modern fixtures because the visit of the 1980s auditorium really didn’t belong in the spirit of our visit. How could anybody cover a Renaissance courtyard once lined with citrus trees and rosemary plants to build a modern auditorium? 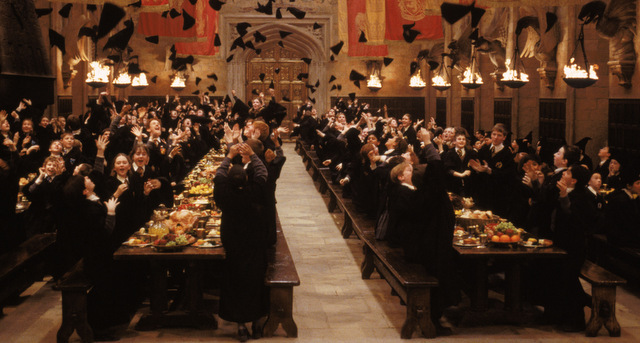 I mean, look at this. It may be functional but my girls and I were sadly surprised by this. We so badly wanted to see how the hospital looked historically that we never expected anyone would use it for another purpose. Big sigh. 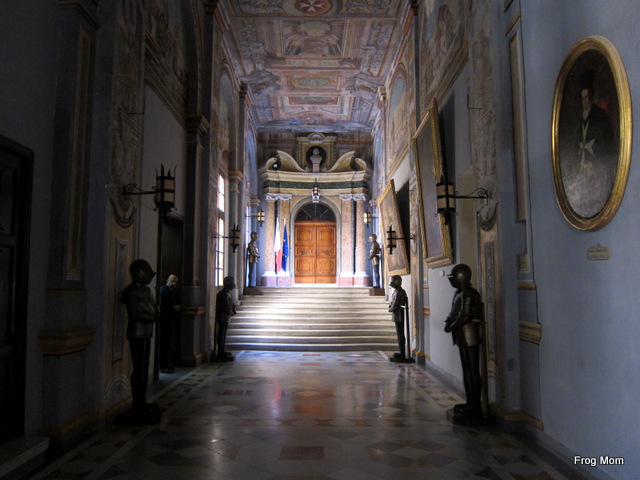 After a gelato at the Great Siege Square, we visited the Grand Master’s Palace and Armoury, a lavish 18th century palace with armors in the hallways, portraits of great masters of the Order of St John and formal rooms to host kings and ambassadors. 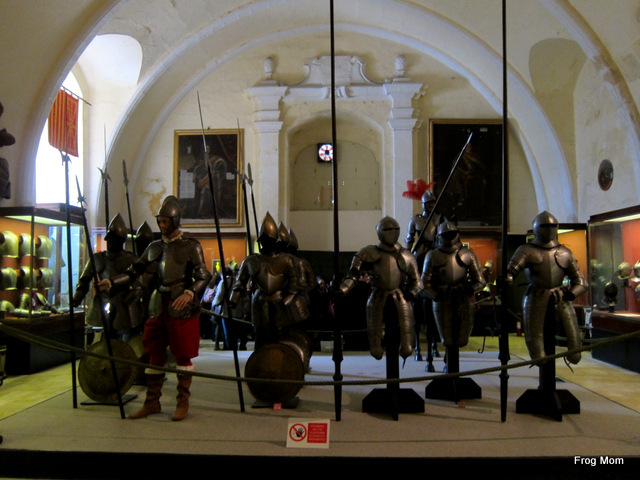 From the courtyard, we accessed the Armoury and I picked my medieval and Renaissance memories to explain to my girls the various weapons such as crossbows, swords, spears, muskets, bayonets, shotguns and other heavy metallic arms that require a wrestler’s muscled arm to lift. They were very interested by the cannons, slightly less so by the huge display of swords. In the second room, the suits of armor – part of a collection of 5,000 16th to 18th century armours – left me wondering how anybody could even move about in these contraptions. Out of curiosity and suspecting treasures for the mind, we entered the National Library and went up the flight of marble stairs to the research room. Oh how I regret I was not able to take pictures. It is the last building erected by the Knights of St John before they were expelled by Napoleon and houses the personal libraries of the Knights as well as 15th century illuminated codices and an expansive collection of books on Malta. What a dream library this is, the type seen in Da Vinci Code and Indiana Jones movies. Imagine, we even saw an authentic 12th century letter signed by a Knight in a display case! In a way, I am very happy we were not able to walk inside the research room, only to peer at it from a small public area. It means nobody could touch and possibly vandalize this extraordinary collection. If you are a book lover or a lover of atmospheric places, this library is a must. 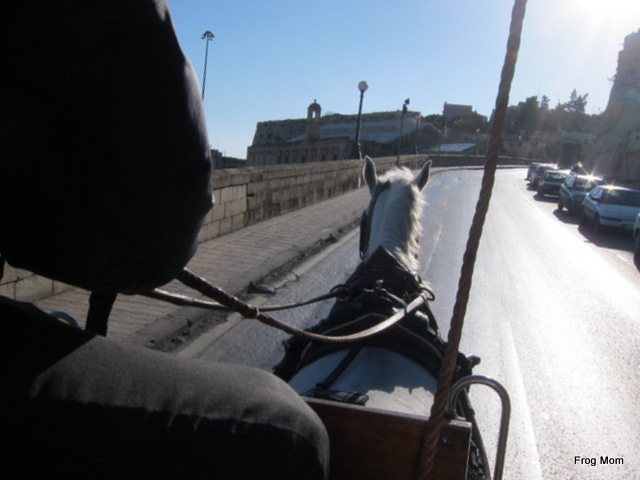 To finish the day on a light touch, the girls insisted we hop in a horse-drawn carriage so I talked to a driver and minutes later we were touring Valletta behind a clippity-clop beautiful horse. When the driver discovered we spoke French, he effusively talked about horse races in Vincennes and all the top jockeys – of course I didn’t know a single name – and French food. In between all that, the guy managed to tell us about Valletta and pointed to various buildings used as filming locations. 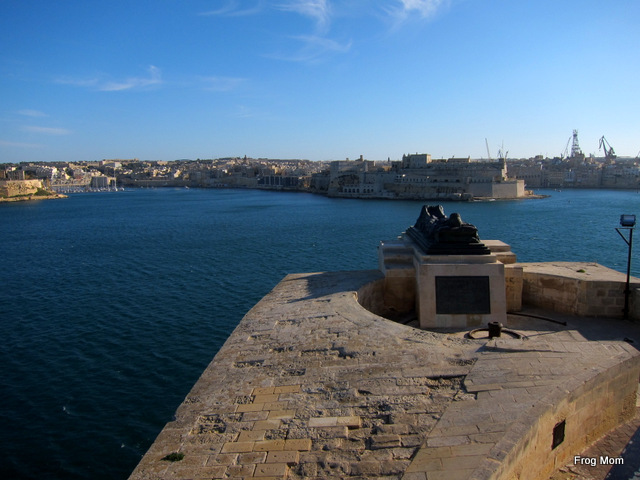 I never knew Malta has been used for so many movies – Gladiator, Troy, Munich, The Count of Monte Cristo, Midnight Express and The Clash of the Titans just to name a few. Wow. After we stopped at the Great Siege Bell to see the Three Cities from the platform, we called it a day. For our last day of touring on Malta, I wanted to get a glimpse of Malta’s archaeological past. 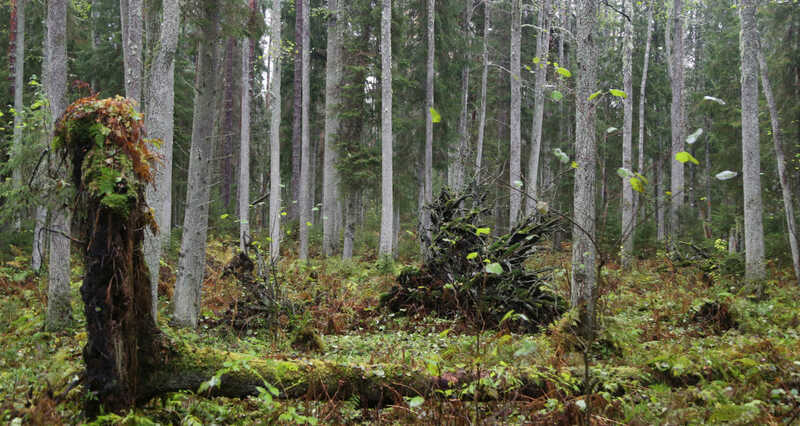 We’d seen the nature, the city, now we were ready for some serious ruins. In Xemxija north of the main island, we followed the Xemxija Heritage Trail. This trail in the hills overlooking a natural bay connects 20 sites of archaeological importance. Though we had trouble finding the start of the trail (the brochure needs to add directions), we lucked out and a guy who was walking his dog pointed us to the right spot. 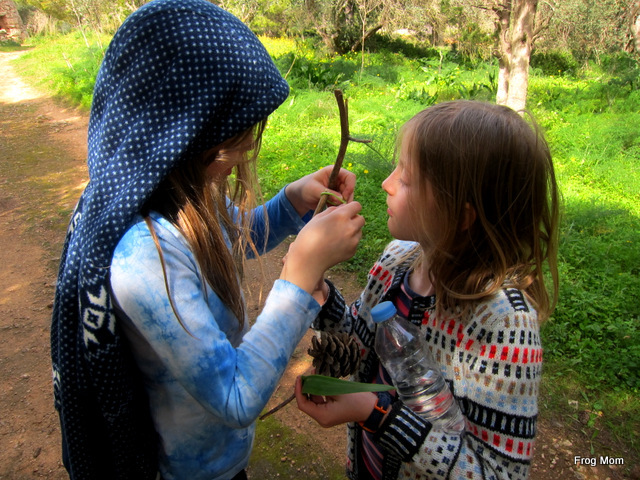 This trail is concentrated over a very small area and a great opportunity to get the kids to run around and explore as there are many areas where they can be wild exploring children. 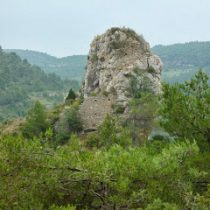 Over the course of 2 hours, we hunched over and went inside Roman apiaries and Roman baths, checked out a galley carving inside a cave, read a poem to an old carob tree, followed cart ruts on a hilltop and walked through a beautiful Mediterranean woodland to see a neolithic temple and a typical corbelled hut. From Xemxija, we drove over to the old city of Mdina where the narrow curved streets were planned in the Middle Ages to stop arrows in the middle ages. Talk about careful city planning! As the old city is entirely pedestrian, the girls and I were able to park outside and roam through the streets haphazardly, vaguely looking at a map but not really. We stopped to ask for the best gelato and were directed to the Fontanella Tea Garden where my girls had a comforting hot chocolate and a luscious ice cream while I tried the divine date and walnut pie. Yum! The airport hour was looming close so we checked off the last item on our list by going to the Playmobil Fun Park in Hal Far. Honestly, I could have done without but my girls insisted and it was convenient close to the airport. 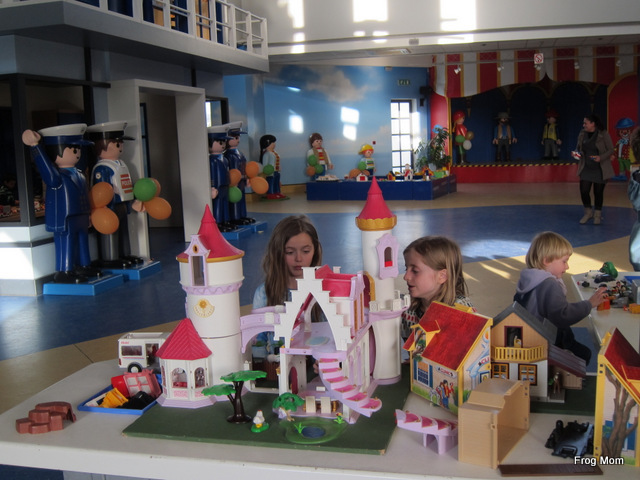 The Playmobil Fun Park is in fact a store attached to a giant play room with some oversized Playmobil figures and features the largest selection of Playmobil structures. My girls’ initial reaction was, “Mom, it’s for babies!” Two hours later, they didn’t want to leave and had built a mini-kingdom with stables, castles, car garage, minivan company and farm. It’s a great spot if you want to relax while your kids get some creative play time. There’s a cafe and very clean restrooms. Thus ended our short but wonderful Malta trip. We stayed in one of the bungalows and it was a great choice as it was in fact a small two bedroom apartment. I could have a bedroom separate from my girls and a nice little kitchen to make tea after a full day out. Had it been warm enough, the bungalow would have been an even better choice as it connected with an open air swimming pool via few steps outside the front terrace. The morning breakfast – I opted for the B&B option – was hearty but lacked healthy and local choices which was really too bad given the deliciousness of Maltese food. As for service, it was excellent. I needed to work from the bungalow and when I complained that the internet connectivity was poor in the bungalow, the front desk hostess was immediately on top of it, calling the internet company and internet was fixed within the hour. After we checked out, we realized that my daughter had forgotten the book she was reading. Not only did the hotel staff find it but they mailed it to me. We stayed in one of the deluxe rooms with a king bed and an additional twin bed for my second daughter. While the room was quite roomy, what my girls really loved was the bathroom. Huge walk-in shower and huge jacuzzi-type bathtub. Let the water games begin! Just kidding. We didn’t do that but we sure took full advantage of the heated indoor swimming pool at the spa. The morning breakfast was held in different restaurants every morning and the buffet was sumptuous I was also very happy that it featured Maltese delicacies such as the delicious cheese pastizzi, local madeira cakes and local sun-dried tomatoes. That’s on top of a very varied buffet with fresh fruit, cold cuts, eggs every which way you want, and other typical breakfast fare. My 9-year old’s favorite was Asian dim sums and my 7-year old’s favorites were little sausages with maple syrup. Very good address smack in the center of Xaghra. I could walk to it with my girls from the Cornucopia Hotel. It was very good but I would recommend only a main course for children as their portions are very large. We made the mistake of ordering appetizers for the three of us and by the time the huge plate of yummy pasta got to our table, my girls’ appetite was almost gone. Before going for dinner, I took my girls for drinks at the Club Bar of the Phoenicia Hotel, a grand Art Deco 1940s hotel with a subdued atmosphere. While my girls had sodas and nibbled on scrumptious complimentary nuts and olives, I savored a glass of Maltese wine and relaxed. I would love to come back with my husband – it’s a cool old-fashioned bar with lots of vintage photographs on the walls. This small restaurant was only 20 minutes walking distance from the Grand Hotel Excelsior and it was a really nice walk too. I was happy to find a casual restaurant that served good Maltese food as well as Indian or Mediterranean and Arab cuisine. It seemed to me Malta was a melting pot of cultures anyway so that would give my girls plenty of options to choose from. We were wiser and picked only a pasta dish for them and it was heartily eaten! This wonderfully located tea garden offers a long (really long) list of pies as well as Maltese lunch staples with gorgeous views of the Maltese countryside. We were lucky to snap a table in the covered (understand, wind-sheltered) part of the terrace and enjoyed looking at a quiet old street. My girls gorged on gelato as well as hot chocolate and a quiche Lorraine (which proved to be a Maltese twist on quiche Lorraine). 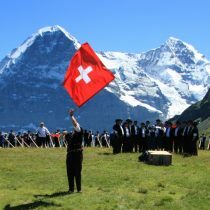 If you wonder where all the other meals disappeared, we also did a fair share of picnicking and ate dinner in the bedroom of the Grand Hotel Excelsior one night. Since we traveled at night, the two other dinners sort of disappeared in airport junk food offerings. This is a fascinating post. 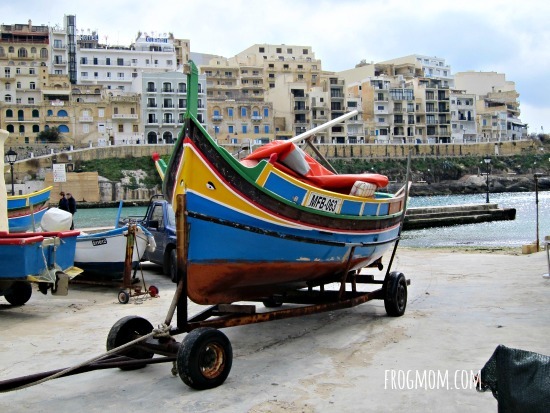 I’ve never been to Gozo or Malta and had no idea it had so much to offer. I agree, sometimes with children you have to do the tacky movie thing to give them a starting point. I remember doing a Time Machine simulator ride in Rome which my son loved and gave him a taster of the city. Great hotel choices too – finding suitable rooms/apartments for families is often so difficult. Thanks Trish! You made me laugh with the Time Machine simulator in Rome, that must have been doing a riot. I agree, I had no idea there was so much to do in Malta either, it was a big discovery on all counts. Since then I’ve also found out Malta has some of the largest water tanks in the world, water tanks used for the film industry. I know it sounds random but I loved the idea you could film a nautical scene with an authentic horizon at sea. I wonder if that’s open to the public:) Anyhow, really cool islands with a lot of character. Oh, and the hotels? I was really afraid they’d cost an arm and a leg – they were both 4 star hotels – but I got such good deals online that they were better value than small B&Bs. An additional reason to go!